Last Sunday Ilana and I completed the BC Randonneurs Pacific Populaire bike ride. 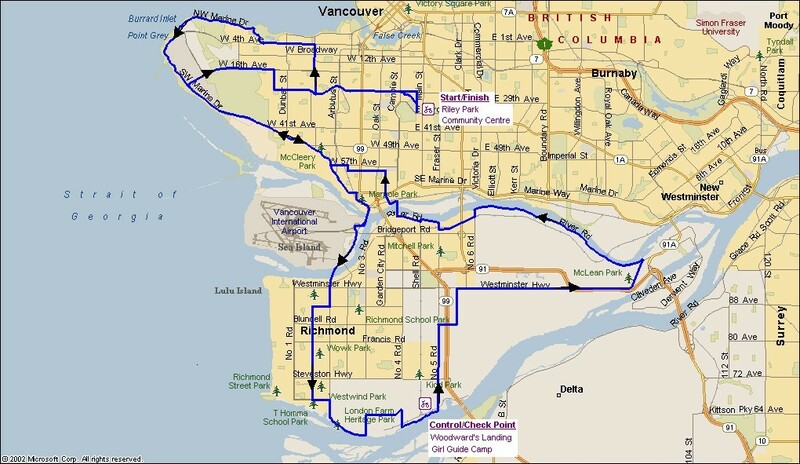 We did the 100km route starting from Riley Park, looping past UBC over the Arthur Laing Bridge to circumnavigate Richmond, back into Vancouver over the Canada Line bridge, looping past UBC again to end up back at Riley Park. Including the ride to/from the start point we did 107km in a little less than 5 hours. That day there was very strong wind coming from the East meaning that on several stretches of road we were battling 30-40km/h sustained headwinds. It was a good start to doing some longer distance rides and it made for a nice shakedown ride for my new Brodie Elan touring bike (more on that in another post). Having never done any riding in the Richmond area, I was really pleased with the route the ride took. Most of the time we were on quiet streets or streets with plenty of shoulder space to ride without having to worry about being buzzed by cars, and several parts of the ride wound through scenic views of the Fraser River delta. I'm always on the lookout for new routes to ride, especially ones that combine significant distance with relatively low traffic, and I suspect I'll ride all or part of this route again this year.